Trapper’s cabins are usually roughly built and tend to rot quickly. Most original cabins built before the 1960s are long past being salvaged and restored, unless they have been kept up and continually repaired. The Museum cabin was built in the late eighties by a retired trapper from Grand Prairie. When he was in his early eighties, he decided to retire and build his retirement cabin on a plot of land in Twin Ravines, south of Stony Plain. He took the cabin apart and moved everything he had from Grand Prairie to Parkland County, where he reassembled the cabin. Sadly, he didn’t have a long time to enjoy his retirement as he passed away shortly after moving in. The property was sold and the owners used it as a weekend escape in the country. When they decided to sell the property again, the cabin was going to be torn down and in 2014 was offered to the Museum. The cabin was lifted and moved by Myshak Cranes and brought to the Museum grounds and its new home that fall. Repair and restoration was completed in the summer of 2016, sponsored by the Stony Plain Fish and Game Association and Wabamun Gun Club, and officially dedicated at our Harvest Festival that year. 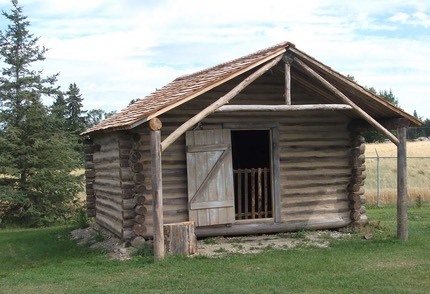 The one room cabin has new lower logs, installed to replace the rotting ones, and a new roof, which was extended to create the small covered porch traditionally found on most trapper’s cabins. The interior is displayed as a typical trapper’s home.